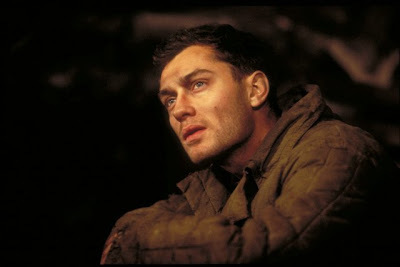 “I am a stone,” Vassili Zaitsev (Jude Law) repeats meditatively while on sniper patrol in director Jean-Jacques Annaud’s most unusual World War II film-- 2001’s Enemy at the Gates. Despite the way it soon veers into unique territory--shortly into the work there’s an obvious nod to the opening sequence of horrifically intense combat devastation that puts viewers right in the midst of battle as witnessed in Steven Spielberg’s bravura opener to Saving Private Ryan which was the most effective and tightest piece of cinematic craftsmanship contained in that particular film. However, Annaud’s contemplative work fixates more on the individual experiences of Law’s “lone wolf” sharpshooter Zaitsev in a stark contrast to the more traditional devotion to one specific Band of Brothers that we’re repeatedly presented with throughout the genre. Despite its absence of a traditional credit, the film co-written by Annaud and Alain Godard drew inspiration for the title from as Variety reports William Craig’s book by the same name which centered on “a duel between a Russian shepherd and a German nobleman during the Battle of Stalingrad (1942-43)." Yet when the screenwriters discovered several differing accounts throughout the official Zaitsev files, they decided to employ artistic license in basing the work on actual individuals but presenting the narrative in a way they saw fit. Much to its benefit, this decision resulted in the creation of an ideal rival for Zaitsev’s sensitive but naturally gifted shooter who’s racked up well over two hundred kills. 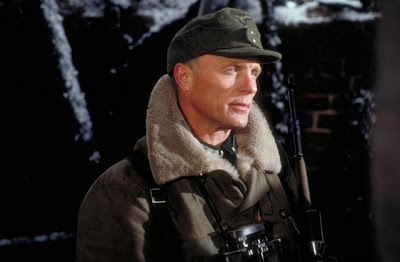 The "villain" of the piece arrives in the form of Ed Harris’s brilliantly acted (yet most likely composite character) Major Konig who is brought over from Germany to try and put a stop to Zaitsev. His goal in doing so is not just because of Zaitsev's talent but because he’s been crafted into a Russian propagandist folk hero in order to rally Stalingrad into what would become one of the greatest turning points of the battle to halt Hitler’s Germany from gaining even more territory. However, on the less effective "creative invention" side, the film fumbles in its development of a believable and engrossing love triangle. Although again they based the participants on real people including Law’s Zaitsev who was in fact romantically linked to Rachel Weisz’s highly educated scholar turned soldier Tania-- and you can never go wrong by inserting a Fiennes brother into the romantic mix (in this case Shakespeare in Love’s smoldering Joseph)—the movie screeches to a halt whenever this becomes the main focal point. It's exacerbated sadly by the awkward dialogue with which Fiennes’s political soldier turned expert journalistic propagandist Commisar Danilov is saddled that weakens his characterization considerably. Following a breathtaking and overwhelming battle sequence that rivals Saving Private Ryan for its authenticity and ability to transport us right into the start of the earliest battles in Stalingrad as soldiers are ominously advised that one man will get a rifle and the other one will follow until the first dies and he takes over—Zaitsev and Danilov encounter one another underneath a pile of corpses. While the nervous yet determined Danilov secures a rifle-- determined to pick off a handful of German soldiers to avenge the deaths of the hundreds of his comrades within close range-- the lower-ranking Zaitsev intervenes, offering whispered advice, admitting he can shoot “a little” before he takes over the assault. And in a dazzling feat of bravery, he manages to stay calm under pressure in his stoic or stone like level-headed approach, executing them coolly and quickly at precisely the same moment explosions go off to ensure their survival. 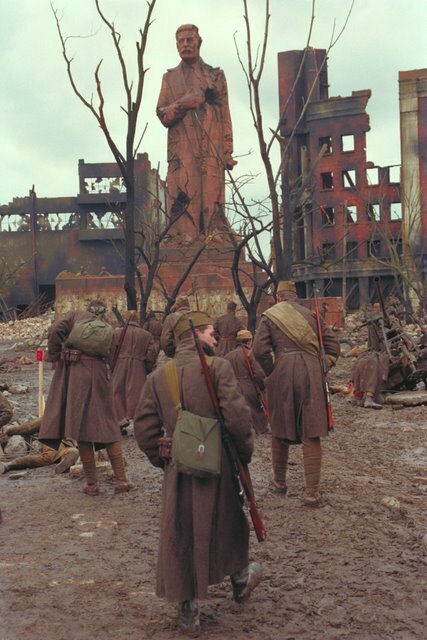 Forming an instant brotherly bond and intellectually daring to go against the traditional wisdom of trying to use fear and threats to spur his countrymen onward, Danilov decides that in the darkest time what Stalingrad really needs is hope and a hero in which they can believe. Working in tandem with Zaitsev as they respond to scores of fan letters-- sort of like an early, war-time version of an agent or PR man and similarly in a way that makes them seem at times like one individual with two heads—Danilov continues his mission by printing off a series of articles complete with tallies of Germans killed, and photogenic black and white hero shots of Zaitsev. While the more humble Zaitsev worries that his friend is exaggerating his skills far too much and he can’t possibly live up to the legend circulating throughout the ranks that garners a favorable response from Bob Hoskins’ Nikita Kruhushchev—he’s persuaded by Danilov that he believes in him completely. Although the highly effective propagandist tool instantly gives everyone something to believe in and the idea that they can stop the menacing force of Hitler’s better-equipped and more experienced soldiers, it also raises not just Zaitsev’s anxiety level but the stakes as well when Germany sends in Harris’ daunting Konig to take him down. 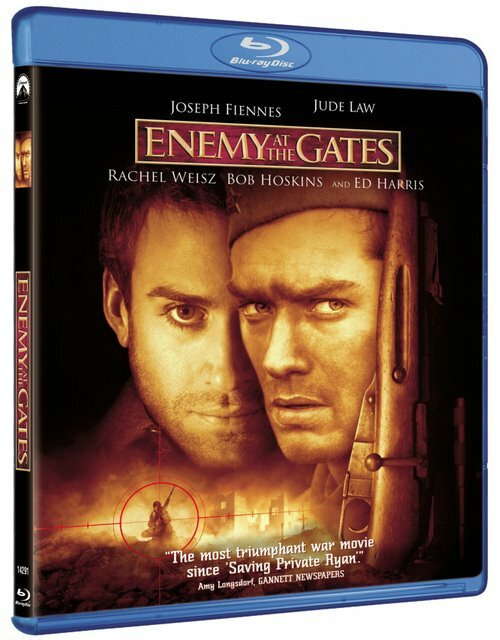 Despite the fact that this is a stellar set-up and that Weisz is always a welcome presence, Enemy at the Gates loses its momentum when Danilov and Zaitsev set their sights (romantic rather than rifle-based!) 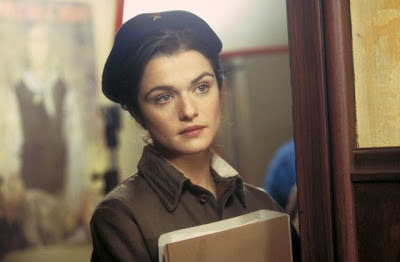 on Tania which finds Danilov growing increasingly more unlikable as the lovely Weisz gravitates physically and emotionally to Law’s quiet sniper. Like a one-man roller-coaster, Fiennes’ Danilov soon resorts to foolish attempts to try and point out Zaitsev’s inferior education and their differences in class as reasons why his own survival as well as Tania’s are far more important than Zaitsev that goes against his earliest character development. And while personally this seemed merely unpleasant and implausible as the film moved along and Danilov became so irrational that he felt more suited to a weekday soap opera-- intriguingly and with solid logic-- The New York Times pointed out that (although I feel it was probably not their intention) his evolution personality-wise “comes close to anti-Semitic caricature,” which “evokes some ugly, ancient prejudices,” that nonetheless even the journalist notes was most likely not the purpose of writers Annaud and Godard. 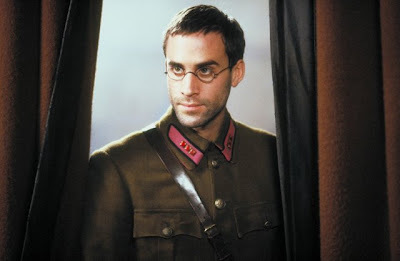 However, much to his credit--while quietly Harris manages to steal the whole movie especially in a series of escalating sequences where he bribes a child he knows is working both sides for information-- Fiennes soldiers on indeed. Surviving the enemy of the ridiculous of script, his performance is an admirable achievement that seriously displayed his first-rate skills opposite a (then) newcomer Jude Law whose mind-boggling talent has grown over time and was best evidenced in another “cat and mouse” effort opposite Michael Caine in Kenneth Branagh’s remake of Sleuth. Still upon seeing it again for the first time since it’s theatrical run and aside from the fact that the romantic plot should’ve been caught in the crosshairs of a sniper in its screenplay form--there’s more than enough plot here for the filmmakers to utilize for the film that salvages it and then some. While the sound balance is a bit off and you find yourself reaching to adjust the volume often to find a suitable mixture of explosions and dialogue, the Blu-ray which also contains some standard edition bonus features is most effective as a sort of chess match. Or, a war film as whittled down to its essence as many have likened—a “cat and mouse” situation as Law and Harris are filmed in extremely tight, blue-eye filled close-ups which comprise an eerie mirror image as they try to find an opening for a clear shot, reminding themselves like Law’s “I am a stone” mantra to remain perfectly still in the meantime. 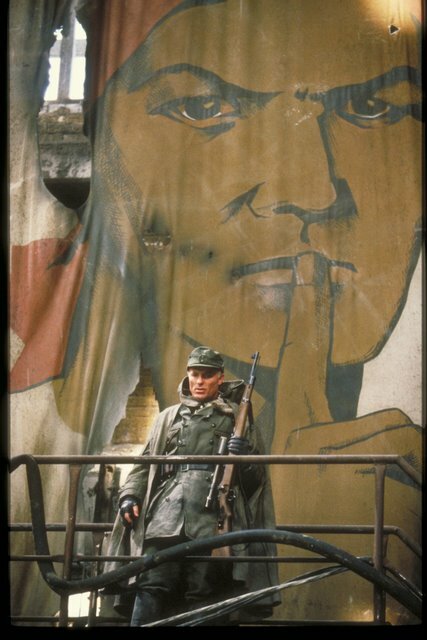 Yet in spite of its structural flaws and a score that sounds all too familiar (Schindler’s List and Private Ryan came to mind but if anyone knows what it is, e-mail me since it’s driving me nuts), the film succeeds in its unusual approach. Instead of fixating on a group dynamic, comprising it as a man verses man battle-- not to mention featuring a woman in the part of a soldier as opposed to a worried wife-- and centering it in Stalingrad helps make Gates highly entertaining and quite distinct in a crowded sea of WWII movies. Working with his The Lover cinematographer Robert Fraise in this exquisitely beautiful picture—that save for a few noticeable blood splatters which hit the lens and thus pulls you out of the moment, calling attention to the work as a “movie”—it’s a striking achievement in its sheer scope as the most expensive British production ever made (upon its release) and one that offers a unique Russian point-of-view of the fight to save Stalingrad. Although at times the colors seem a bit soft in the visual transfer-- which if memory serves correctly were originally present in the film print as well since they were shooting without a large emphasis on artificial light to keep everything naturalistic with some tension filled moments of hand held battle shots—the Blu-ray excels in its three-dimensional picture quality. Moreover, this is evident right from the start as the soldiers attempt to stay alive huddled in boats as they cross the sea only to struggle to stay alive on land in one of Annaud’s most riveting sequences that fortunately is addressed in a bonus feature indicating just how many explosions were actually going off (triggered by stunt men) at the time to fully immerse the actors, filmmaking team, and indeed the audience in what the chaos of war is like. And while here, his film does as mentioned earlier draw comparisons to Ryan and several other epic battle pictures—Gates seriously entices once it settles into a suspenseful and more intimate (yet no less deadly) exploration of the side of the war waged by snipers who must stay awake for hours or days waiting for the right moment to squeeze the trigger before the other one does it first. Hence, "I am a stone. I am a stone."